Our core mission is to create software and tools for Fire and Safety training that help virtually anyone imagine “what if’s” in their first-due response area—as a means to prepare effectively. We recognize that to fulfill this mission, we not only have to make the simulation creation process simple, we also have to make the simulation sharing and extension process easy. 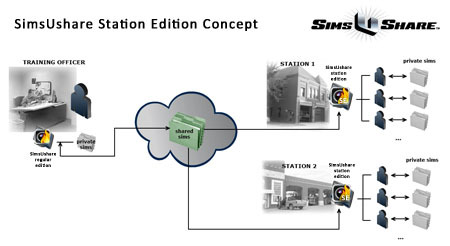 Whereas the SimsUshare Platinum Edition is limited to a single user (and single login profile, on multi-login-profile computers), the SimsUshare Network Edition (formerly Station Edition/Site License) lets everyone in the organization create and share simulations–any number of user profiles on one or more station computers. As you see the benefit of more personnel being able to create simulations, and the need to share simulations easily, you will see that the Network Edition is much more economical than buying individual copies of the Platinum Edition for Windows. Note: The Network Edition is priced $495/year for any number of users on up to ten (10) computers. If you have more or fewer computers, please contact us for adjusted rates. You can always add more computers to your license as your needs expand. For complete documentation on the Network Edition, please visit our Documentation Page. For installation instructions and information about installing it on a network, please download this document. To purchase one or more copies of the standard ten computer Network Edition, please visit this page for Windows. Who is the SimsUshare Network Edition For? If you want to allow multiple users (people) to create and play simulations on one computer, the Network Edition lets you do this. Furthermore, it lets you designate certain folders for sharing sims, and thereby easily distribute sims from your own area to the field. Therefore, it is now easy to make the creation and use of simulations something to which everyone in your department can contribute. If you do not have shared network drives, or even if you do, you can use third-party services such as Dropbox (http://www.dropbox.com) to share simulations among your personnel. How is the Network Edition different from the Personal Edition software? The personal version of SimsUshare is licensed to a single user for use on that person’s one computer. Sharing simulations is accomplished through a manual process. The Network Edition is a package that allows anyone in the station to create and share simulations directly in the program. Sharing simulations on your network or via Dropbox. The ability to enable supervisor(s) (such as the training officer) to set up shared areas/folders on the Department’s network (or through services such as Dropbox) from where simulations can be retrieved, updated, and stored automatically. Installing the Network Edition may require one to set appropriate permissions on your Department’s network, and therefore should be installed by your network’s administrator(s), even though the process is not so complicated. The documentation provides directions to make sure this process is as simple as possible, and of course we encourage you to reach out to us if we can help you. The SimsUshare Network Edition is a different program from the Personal Edition SimsUshare software distribution, and requires you to get a license code that enables this functionality. Each of the following example uses comes back to the same principle—the widest possible benefit for simulations can be obtained by enabling more people with experience to create and share simulations. You want to allow any user on one or more computers to create their own simulations. This is the default configuration, in which each user’s sims exist in their own profile only, on the specific computer the sim was created on. Sims can be copied to other users, but the process involves manually copying and pasting sims. You want to allow any user on one or more computers not only to create their own simulations, but also to play a common set of simulations. For example, the training supervisor may want to have a monthly focus for training, supplemented by a set of simulations for the field. The supervisor can specify one or more folders as “play only”. Each user can see and play the simulations, but not edit sims from the group/folder directly. However, the user can copy any of these sims into their own private area for editing. You want to allow any user on one or more computers not only to create their own simulations, but also to share (play and edit) a common set of simulations. The training supervisor can make shared folders (or even Dropbox) allow both playing and editing sims. The danger with this configuration is that if several users have this permission, they can modify the work of others. A productive example might be having special “Station1”, “Station2”, etc. folders, where each station has play/edit access to the proper folder, and the training supervisor can pull out sims from any of these folders to place in the common sims folder. You want to allow a user’s private sims to travel among computers with SimsUshare. By default, sims are stored in a user’s “Documents” folder. The new features of the Network Edition allows the administrator to specify an alternate location for the default, which can be a network drive, and therefore be accessible from whatever computer the user logs in at (provided the SimsUshare software is accessible on that computer as well). This function is also available in the regular SimsUshare software, version 1.1.2 and above (Windows/Mac, currently). Neal Dicus, Network Infrastructure Administrator from the City of North Little Rock, AR, shares his tips in SimsUShare Sharing Simulations for how the Department shares simulations through the Department Edition. Thanks, Neal!